One of the well-known problems with the DR650 is that it stands so upright that it’s easily tipped over on its right side. And with a load, like a surfboard (which will be on the right side) and luggage it’s guaranteed to fall over when parking on level ground. Stiffer fork and shock springs help, as that makes the bike taller pushing the center of gravity up causing it to lean more over on the kickstand, so I’ll get the springs. But I’m getting the springs primarily for handling/performance reasons. 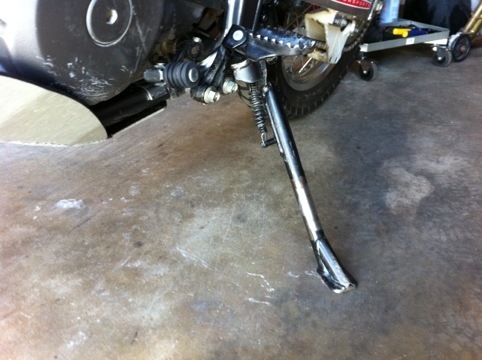 Instead, I increased the lean by cutting 1/2″ out of the kickstand, a $25 mod by Bob at Elco Welding in Venice. Perfect! 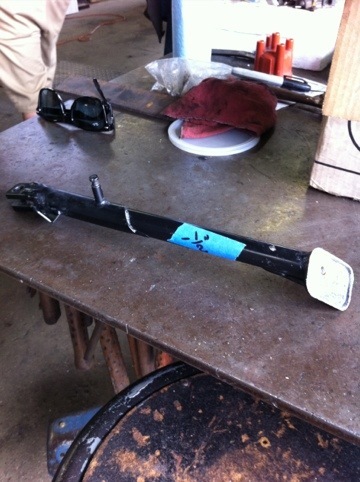 The pics below are: The kickstand awaiting the operation at Elco Welding, post-op (Bob smoothed out the weld on the visible side – nice work), and the new lean angle. In pre-op at Elco Welding. 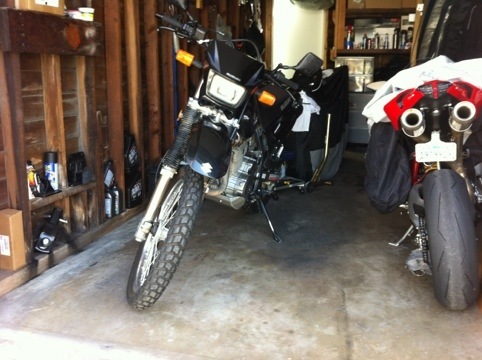 The cut and welded side stand. Bob smoothed out the welds on the outside, the visible side. I don’t think I’ll paint it black. I like the “worked on” look.